A Follow Spot: I've Been Waiting for BLOOMER GIRL! I absolutely love that Illinois Wesleyan University's Music Theatre Society puts on a lesser-known, eminently revivable piece of musical theatre every year. Instead of the same old, same old, the Music Theatre Society goes for neglected gems like Big and Do Re Mi. This year, it's Bloomer Girl, a fizzy and spirited Broadway musical from 1944 that tackles freedom and repression. 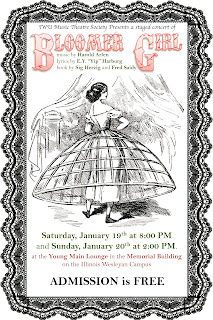 IWU's Bloomer Girl, directed by Associate Professor Scott Susong, is scheduled for two performances in the Young Main Lounge in the Memorial Building on the Illinois Wesleyan Campus this weekend, with an 8 pm curtain on Saturday, January 19, and a 2 pm matinee on Sunday, January 20. So what makes Bloomer Girl worth a visit? Well, if I said "Over the Rainbow," "Stormy Weather," "That Old Black Magic," "Come Rain or Come Shine," "I've Got the World on a String," "One for My Baby (And One More for the Road)," "It's Only a Paper Moon," "The Man That Got Away" and "Get Happy," what name would come to mind first? Maybe Judy Garland, since she was associated with at least three of those songs. But they're all the work of composer Harold Arlen, who wrote some of the best melodies ever in popular music. There is simply nothing like an Arlen tune. Many of the songs listed above also featured lyrics by E.Y. "Yip" Harburg. That's who Arlen worked with on the score for The Wizard of Oz as well as Bloomer Girl. The Arlen/Harburg songs from Bloomer Girl aren't as well known as "Over the Rainbow" or "If I Only Had a Brain," but they're still terrific, from the comic feminist anthem "It Was Good Enough for Grandma," to the love song "Right as Rain," and "Evalina,*" which Bing Crosby turned into a Top Ten single. The book for Bloomer Girl was written by Sig Herzig and Fred Saidy, based on an unpublished play by Lilith and Dan James. It's set in Upstate New York during the American Civil War, with issues of emancipation front and center for several characters. Or, as Illinois Wesleyan's press release puts its: "The plot centers around independent Evalina Applegate, an 1861 hoop skirt manufacturer's youngest daughter who defies her father by rejecting hoopskirts and embracing comfortable bloomers advocated by her aunt Dolly Bloomer. The American Civil War is looming, and abolitionist Evalina refuses to marry suitor Jefferson Calhoun until he frees his slave. The heart of the piece is the exploration of hopes and dreams within working class society and the intersection of equality for both women and African Americans in Nineteenth Century." Bloomer Girl began on Broadway with Celeste Holm as Evalina, the girl who wants to give up her hoop skirts to wear trousers, and then came back for a short stint in 1947 with Nanette Fabray. There was even a shortened 1956 TV version with the fabulous Barbara Cook in the role. Since then, there haven't been a whole lot of revivals of Bloomer Girl -- some speculate that's because of the show's rather complicated costume requirements -- but it did get picked up for an Off-Broadway production in 2000 and a City Center Encores! staging in 2001, with Kate Jennings Grant as the Bloomer Girl, Kathleen Chalfant as her aunt Dolly Bloomer, and Philip Bosco as mean old Dad. Heather Priedhorsky will play Evalina Applegate for IWU, with Jordan Lipes as her potential beau Jeff Calhoun, who hails from Kentucky; Reggie Cook as Pompey, a slave hoping to be freed; Erica Werner as Aunt Dolly, the big bloomers proponent; Josh Levinson as Horace Applegate, Evalina's dad and a major hoop manufacturer; and Patsita Jiratipayabood as Daisy, an amourous maid. Others in the cast include Chloe Bluml, Carlos Medina, Forrest Loeffler, Kelsey Bearman, Alec Sutton, Kelsey Vonder Haar, Steven Czajkowski, Emilie Hanlet, Chris Long, Caroline Wagner, Bucky Emmerling, Rosalie Alspach, Evan Dolan, Halimah Nurullah, Natalie Howard, Ian Stewart, Kayla White, Megan Win, Elizabeth Albers, Anne Kehler, Julia Cicchino and Lydia Hartlaub. 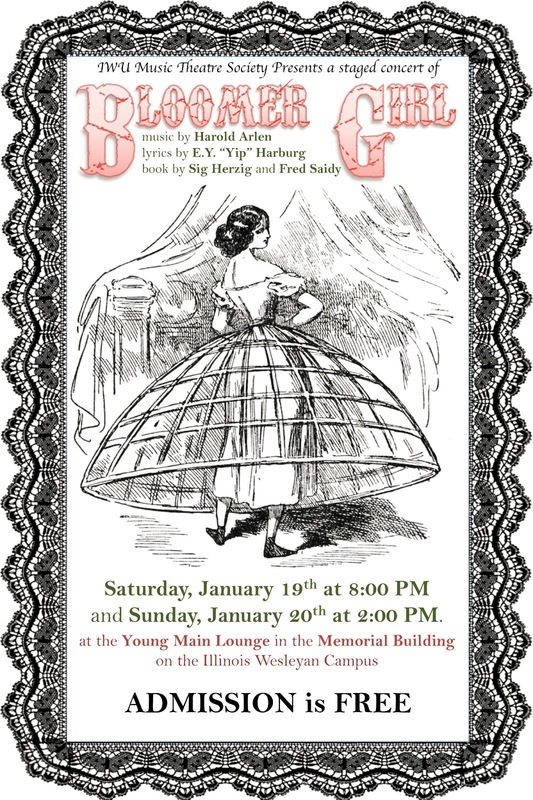 You can check out Bloomer Girl free of charge at 8 pm on Saturday, January 19, or 2 pm on Sunday, January 20, in the Young Main Lounge in the Memorial Building on the Illinois Wesleyan Campus. *There seems to be some confusion whether the name is "Evalina" or "Evelina" -- it's Evalina at the Internet Broadway Database and in IWU's press release, but Bing's single seems to have been "Evelina," Barbara Cook's character is listed as Evelina at the Internet Movie Database, and the venerable New York Times went with Evelina when it reviewed the Encores! production. Still, I decided to hang with the IBDB and IWU on this one. Thanks, Julie! I'm sometimes puzzled why nobody does this one any more. It has all those great Arlen-Harburg songs, a different and interesting story, and lots of good parts (which is maybe a problem professionally these days, but not for school or community productions). I admit that the ending is a tad puzzling: we get this grand dramatic Civil War Ballet, complete with the return of those soldiers who survived (a big Agnes De Mille statement for the women worried about their men who were away in WWII), and then in the last scene the boys in our story are still heading off to fight. But that doesn't negate all the rest. And maybe the real version explains it better than what I saw at Encores. The TV version with Barbara Cook is on DVD now, on the VAI label. And someone put her reprise of "Evelina" online (she's mocking Jeff's previous serenade of her with this song). http://www.youtube.com/watch?v=dgN8NWM1iKw She really is wonderful in this (I can't imagine that Holm or Fabray were any better), and we have so little video of her at this early stage of her career. "...fizzy and spirited..." I love that! I am so lucky to have found this blog out here in the middle of the cornfields. Glad you found the blog, Allen! Jon, Scott Susong told me they've had to cut the Civil War ballet because of lack of rehearsal time. They normally put together these Music Theatre Society shows in 10 days, but because of other issues, only had 5 days this time, and there just wasn't time to work in the ballet. It sounds like I won't miss it! I added your link to the Barbara Cook video, Jon. Thanks! !